Chicago Mayor Rahm Emanuel was among more than 9,000 athletes that competed in the 33rd Transamerica Chicago Triathlon. Emanuel, known for his enthusiasm for fitness, participated in the event for the first time since 2011 and posted a time of 1:39:58. Back in 2011, he finished the race at 1:36:50. 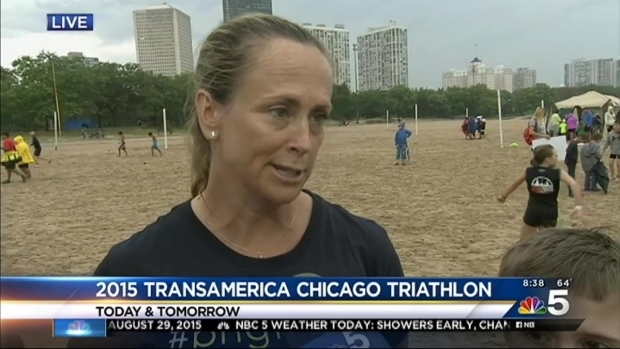 About 9,000 athletes in the Transamerica Chicago Triathlon, which is the world's largest event of its kind, hit Chicago Saturday to swim, bike and run. NBC 5's Emily Florez reports. Emanuel clocked a longer time this year, however the event’s new bike course added 2.5 miles to the bike portion. Almost 10,000 cheered on the race participants who came from all over the U.S. and ranged from as young as 7 to 84 years old.